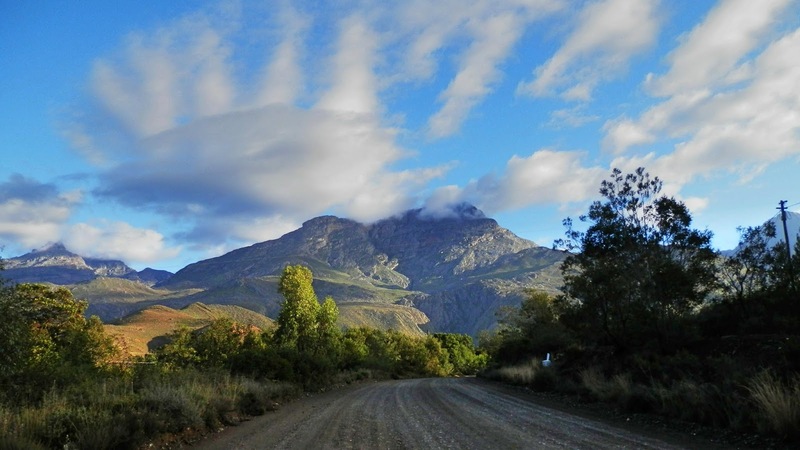 One of the reasons that we came to the town of Ladismith was to do a hike that we had read about. And, there's a kind of an oddball story that goes along with this hike. So we were up at 5:30am yesterday morning. We had read that it was a difficult climb up and so we wanted to do that part early before it got too hot out. The hiking route took us midway up Elandsberg Mountain. There is a separate trail that goes to the top, but that's an overnight hike and we're not prepared for that. A gorgeous start to the day, heading towards Elandsberg Mountain. We left the parking area at exactly 7:30am. They said to allow for between five and nine hours to do the whole route, depending on your abilities. There's a steep rise in altitude of about 800 meters (2,500 feet) over the seven kilometers to reach Stanley's light. The entire circular route back to the parking area is almost 13 kms (8 miles). By 8:00am we were already getting some nice views looking back towards town. But there's still a loooong way to go! Check out the tail feathers on this little one! Yup. They had said it was going to be steep. Two hours in, we were getting some beautiful views. And we were seeing some other natural things too! Some parts of the trail were a little overgrown. Kevin, refilling the water bottle from a mountain stream. It was 10:30am when we arrived at "Stanley's Light". Stanley De Wit was a local farmer and avid hiker. He had made several trips up the mountain and in 1963 decided that he would install a light on the mountain. 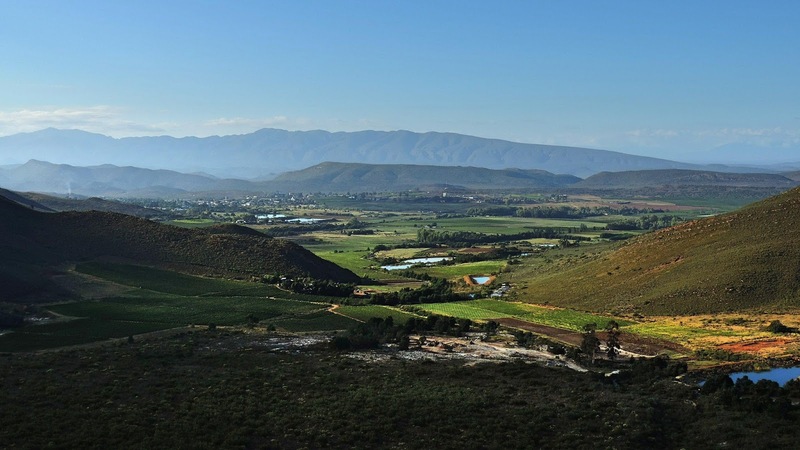 One that would be visible at night from the valley below and the nearby town of Ladismith. Why people do the things they do, we'll never know. But during several trips up the mountain in May 1963, he carried up 22 meters of plastic pipe, electrical cables, cement, and sand as well as a small waterwheel and a bicycle generator lamp. Remember the old style bicycle lamps? The ones with the little generator and wheel that spun against your tire? Anyhow, on May 31, 1963 the lamp was operational. The smallest hydroelectric plant in the world! Stanley hiked up here 278 times over the following 30 years. Changing light bulbs, and making modifications to the system. The bicycle light was later replaced by two 24V motorcar lights and the generator by an alternator. A solar panel was installed to provide power after a drought, for the alternator to start when there is water. Stanley's Light as it is today. Stanley de Wit died October 14, 2012 at the age of 86. The view from the light. The light is supposedly maintained by a group of volunteers, but they're apparently not doing a great job of it because we haven't seen the light on during the three days we've been here! We rested for a half an hour and had some lunch. Shortly after we began the route down, we bumped into the only other person we met on the trail. He was alone except for his three dogs and he said that he hikes this trail once a week! Said he could count on one hand the number of times he's met someone else on the trail. The way back down was hard on the feet and knees. Some rocky and steep sections with loose sharp stones. We arrived back at the car at 1:30pm. Six hours...not bad! Pretty tired though, and just relaxed for the rest of the day! Incredible hike, great story, and Stanley must've been an amazing man. Thanks for another wonderful read and adventure! It was a great hike and the weather was perfect. I can't believe that Stanley did that hike 278 times, wow! A great story and hike, plus very ambitious. It was a pretty strenuous climb up but to be honest we find the going down much harder, probably because we don't stop as often as we do when we go up. Thought it wasn't well used with the grass being so high! I don't think it gets used as much at this time of year because it is much hotter. It probably gets used more in "their" winter months and perhaps they go up and cut it back a bit before it starts to get busy. They also hold a race on that trail sometime in April. What a great story. Stanley really must have wanted to have his light shine. That first photo the clouds almost look painted on! How cool! We can't believe how well that photo turned out as soon as we looked at it we both said "wow"! Not sure it the light just wasn't working because there wasn't enough water pressure to run the little generator. Nice story and history behind the hike's destination. Always more interesting and satisfying if you have a goal, right? We love to have a goal when we do our hikes, like a waterfall, a beautiful view or a cave in this case it was the story to made us want to do this hike and the amazing views.